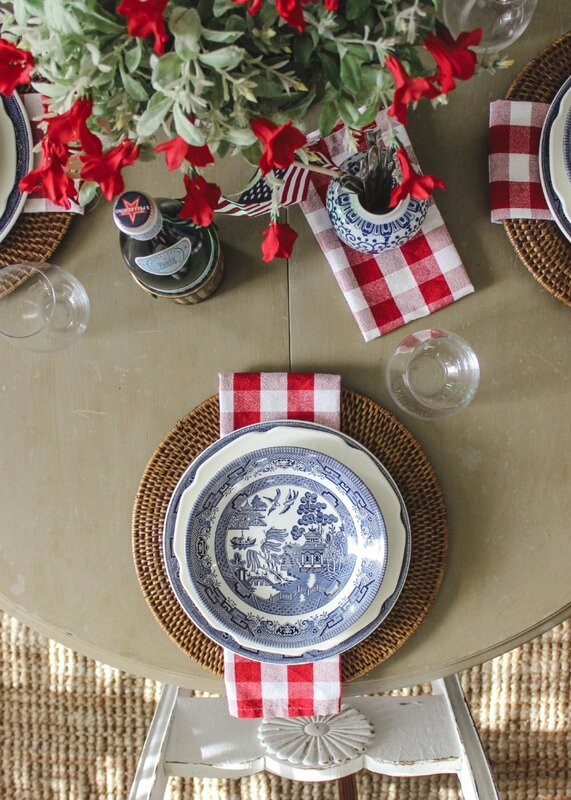 With the fourth of July coming up, I thought it would be fun to set the table with something festive! even though we most likely won't be home on the actual holiday, as we'll be celebrating with family, I always love a reason to set the table. you can always expect to find blue + white around here, but I wanted to throw in a little red in honor of independence day. I used some gingham cloth napkins I found a few years ago at HomeGoods and folded + tucked them under my dishes and on top of my new rattan chargers. if you're observant or simply have eyes, you may notice I only have three place settings. there's a few reasons for this... I recently found these chargers at Tuesday Morning. they were listed for $9.99, but marked 20% off. I had a gift card so it seemed like perfect timing and just the thing to spend it on... except there were only three chargers in the store. 6-8 would be an ideal number to have on hand, but I'd even take as little four. I hope to find some more at the right price... someday. as it turns out, having just the three rattan chargers works for now due to a couple other random circumstances. one of those being that I currently only have three chairs to use as seating in the dining room. last year, I gave our five old chairs to my younger sister to use in her college apartment. there were four dining chairs taking up space in our garage that needed some work and I thought giving our former chairs away would incentivize me to get my act together and refinish the others. what do you know? a year has passed and I only just finished ONE of the four chairs two days ago. we scrounged up three other, mismatched chairs to use in the meantime. there seems to be a recurring theme of the number three here, so it only makes sense that I would have exactly three Blue Willow dinner plates. I only recently started collecting blue + white dishes, so my collection is on the smaller side. in this case, it works out! with the exception of the chargers, napkins, glasses, and flowers, everything else on the table is secondhand—both thrifted and gifted. the Blue Willow plates, blue + white jar filled with mismatched silver, ice bucket [that is being used as a vase here], and brass bottle holder were all found at local thrift stores. the Blue Willow bowls and white dishes were given to me on two separate occasions by two sweet women from church. that's one of my favorite parts... not just about this particular table, but about creating a home. taking something old or unused and giving it new life. we plan to spend the fourth with family, but I've enjoyed creating this table and having a pop of red in the house. what a blessing it is to live in a country like our own. and what an opportunity we are given, as Americans, to be good stewards of the freedoms we have because of the sacrifices of others. I pray that is not something I ever take lightly. and just to keep things real... here's one last shot that includes the natural state of our dining room—well, almost natural. the natural state is much louder and messier with two little boys running + crawling around. not only do we dine in this space, we also ball here. the tiny white house is a house of ballers. 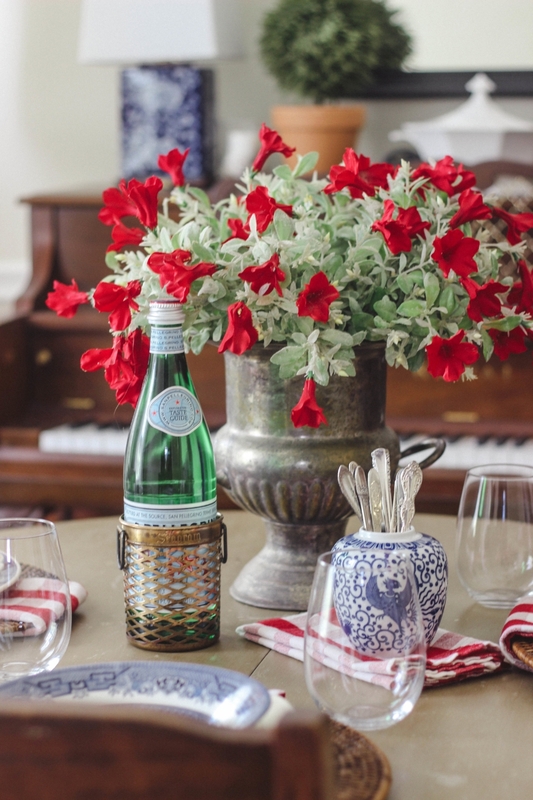 red petunias | Paul Michael Co.
blue + white dishes | Blue Willow via Wedgewood & Johnson Bros.